I think I've shared this with you guys before, but incase you missed it last year... THE EASIEST FUDGE RECIPE EVER!!! Dump the ingredients into a small saucepan and heat until bubbling. Bubble for about a minute and then pour in either an 8x8 baking pan, or *my favorite* the little tin pie pans that are about 4" across. Each batch will fill 3-4 of those puppies depending on how thick you like your fudge to be. Cool and try not to just eat it with a spoon! Told you it was the easiest ever! My favorite is peanut butter chips with vanila frosting. YUM!!! This year, I think I'm going to try white chocolate with vanila frosting with a little mint extract with crushed candy canes on top. I'll let you know how it turns out! Now for shameless plugging... 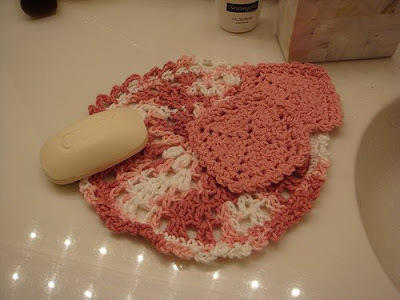 If you've come from my mom's blog, go check out my hand-crocheted spa-cloths in my Etsy shop. The are soooo super soft, and make your skin feel the same way :) I think they're the perfect gift. Just add a bottle of your favorite body soap or facial cleanser and any woman would swoon! Or a Christmas Dishcloth Set! 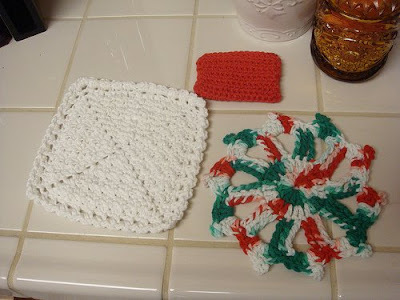 Once you've used a crocheted dishcloth, you'll never go back to terrycloth or paper towels or even sponges!!! I like to add a set of Williams Sonoma Dishsoap and Hand Lotion to these for great housewarming/hostess gifts! 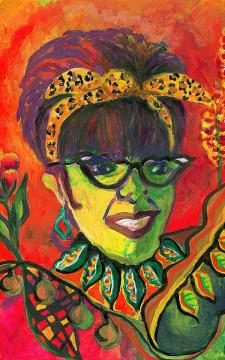 All of my cloths are made of 100% cotton and can be machine washed and dried! Good for your skin and good for the Earth! Thanks for the fudge recipe ...think I'll try this one. Sounds super easy and a great give away gift! 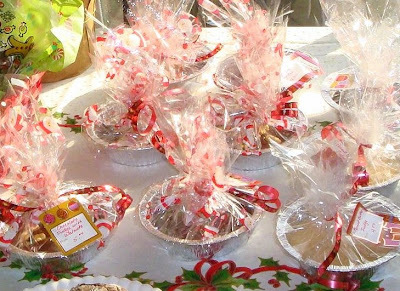 I am soooooo cooking your fudge recipe for gifts this year! thanks so much. Have you tried "Haystacks"? Chinese crunchy noodles (from the can), stirred into melted chocolate chips. Place by spoonfuls on wax paper to harden and cool. Instant crunchy cookie! You could add all sorts of stuff to this recipe too...cocoanut, peanut butter, etc. OK. It's Sunday. I made your fudge recipe...classic style: Semi-sweet choco chips; chocolate frosting; walnut bits. OMG! It turned out beautifully! It slices into perfect cubes and tastes fantastic. This is definitely going to be my holiday go-to gift recipe! Thanks! Hrm- never heard of such of a fudge. Neato!! hey i miss you and owe you a dinner!